Today, Native Americans are widely recognized as the muse for our underthings as well as the wellspring of our cultural appropriation needs. Oh, but it turns out they also love their families, take pride in their communities, and wish to pass on their cultural traditions to their children. Interestingly enough, Native Americans are fully realized human beings who want to be viewed as such, rather than as a costume idea or a source of fashion inspiration. Apparently, the idea that Native Americans are humans who are eager to raise their own children was so subversive that the federal government had to put it in writing. I know this will come as a shock to all seven of you who truly believed in the transcendent love story of Pocahontas and John Smith, but it turns out that the historical relationship between the government and Indian tribes hasn’t been all that great! In 1978, Congress enacted the Indian Child Welfare Act, designed to prevent Native American children from being displaced from their communities. The goal of the ICWA is to “promote stability and security of Indian tribes and families.” Before the ICWA, thousands of Native American children were forcibly removed from their tribes and sent to boarding schools that sought to assimilate them into white culture. These kids were forced to cut their hair, forget their language, change their names, and embrace Christian morality. Native American families have also been favored targets of child welfare investigations. Before the passage of the ICWA, anywhere between 25 and 35% of Native American children in some states were removed from their homes and placed in non-Native American homes instead. The numbers aren’t much better post-ICWA, either. In South Dakota, Native American children still make up 61 and 68% of children who are taken and placed in foster care each year, even though Native Americans make up just 13% of the total population in that state. The ICWA regulates custody and placement of Native American children not only in foster care, but in adoption proceedings as well. Preference must be given to the child’s extended family or to a member of the child’s tribe over a non- Native American adoptive parent. 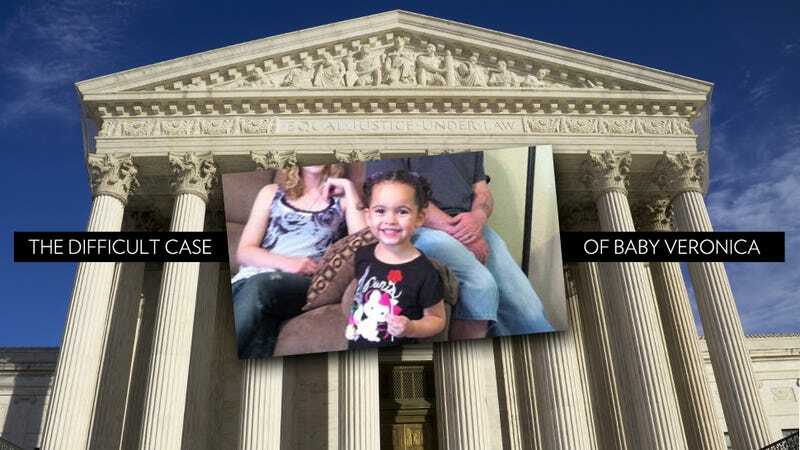 All this brings us to this week, where the Supreme Court heard oral arguments in Adoptive Couple v. Baby Girl. At issue in this case is whether a Native American baby girl, adopted by a white family in South Carolina, should be returned to her father, a member of the Cherokee Nation. The biological father in this case is contesting the validity of the adoption under the ICWA. The adoptive parents in this case, Matt and Melanie Capobianco, adopted baby Veronica from Christina Maldonado, a non-Native American woman from Oklahoma. Prior to giving birth to the baby, Maldonado cut off all contact with the biological father, Dusten Brown. Brown responded by texting Maldonado to tell her he was giving up his parental rights and refused to pay child support. Maldonado opted to give the baby up for adoption. The ICWA requires that a tribe be notified in the event of an adoption involving a Native American baby, but Maldonado’s attorney not only misspelled Brown’s name on the forms and botched his date of birth, she also identified the baby as Hispanic, not Native American. As a result, no tribe was notified of the adoption. Although Brown ultimately signed the adoption papers, he says that he thought he was relinquishing his rights to Maldonado, not to the Capobianco family. After Brown realized his error, he filed a petition to block the adoption. But the adoption case wasn’t heard for over two years after Brown filed his petition—his daughter had been living with the Capobiancos that whole time. In 2011, the South Carolina courts ordered the Capobiancos to relinquish custody of the Veronica to Brown. Ugh. That sensation that’s coming over you? That’s what doctors call “all of the feelings.” This is really tough. Cross-cultural and transracial adoptions can be complicated because it can be difficult for adoptive parents (hearts = squarely in the right place) to provide meaningful cultural connections for their children. In this case, there’s an added layer of complication because it’s governed by federal law rooted in a long and sad history of child removal. The reaction to this case has been overwhelmingly pro-Capobianco, but the support has also been marked by an undercurrent of prejudice, cultural superiority, and ignorance. When the Baby Veronica’s case first became known last summer, over 20,000 people signed a petition to “Save Veronica.” Not only that, the ICWA was characterized as “obscure,” “unusual,” and as a technical “loophole.” Commentators on CNN openly posited that the decision to return to Veronica to her biological father was not in her best interest. Why not, exactly? Because the Capobiancos are really nice, and have a nice house, and live in a nice neighborhood? Veronica’s biological father is a veteran who loves his daughter, and he has the support of his tribe and his community. What does Veronica need saving from? Brown may not be perfect (ehh, I don’t love his initial decision to refuse child support payments) but since when was that a requirement for being a good parent? Good grief! Perfection isn’t the standard for parenting, otherwise we’d all be tween hobos. The real problem here is why we assume that a Native American upbringing must be worse than a middle-class white one. Cultural differences do not equal quality of life differences. Moral judgments of Native American communities resulted in prejudicial treatment of parents and children, and that is what led to the passage of the ICWA in the first place. It’s not only in Veronica’s best interest to be returned to her father, it’s in her tribe’s best interest, too. Veronica has the right to know her tribal and cultural heritage, and her father has the right to pass on his traditions and values to her. Removal policies of the past demonstrate how devastating the loss of Native American children can be to tribal nations. As hard as this case is, this is why the ICWA exists—not to make life hard for adoptive parents, but to make life better for Native American families. Meagan Hatcher-Mays is currently a third-year law student at Washington University in Saint Louis. She currently teaches “Women & the Law” to a group of brilliant undergraduates. She yells a lot on Twitter. Images via KFOR-TV and Shutterstock.